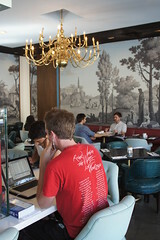 LAMill is in the heart of what some consider the starting point of the growing “artisan coffee” trend in Los Angeles. Indeed, Intellgentsia’s entry into the market started just a few blocks away and ever since, shops have been popping up all over LA to stake their claim. Suffice to say, Intel is no easy competition. Every customer who comes to Silver Lake for coffee is going to ask themselves, “where do I want to go?” Intel has quite a rep and a great product, so it will be a tough choice. Despite this, I highly suggest people check out LAMill as an “alternative”; they have a completely different approach, atmosphere, and mission with their coffee. 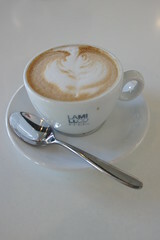 No doubt, LAMill is a surprisingly solid coffee roastery in it’s own right and an established spot in SL. 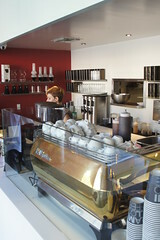 From the moment you step in, you realize it is a rather atypical coffee experience. I was met by a friendly young lady with a food menu, requesting that I take a seat. After some confusion, I asked if I could simply sit at the bar. While this was a welcomed touch of professionalism, it was almost too much; being waited on at a coffee shop is a tier of culinary methodology I think most people (myself included) would not anticipate. I figured a roaster would focus more on a bar then a menu. It would probably be the “black tie” affair of coffee shops. But, at least it is something different. Their space is impressive. 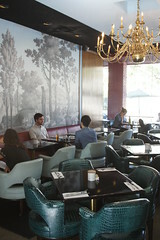 The decor was great; from the notable wall paper to the high end faux-crocskin seats, the dining area was an excellent amalgamation of high-end meets cosmo-diner. It was rad, not too serious with a unique flair. Without a doubt, my favorite piece is the L-shaped sitting bar. From this spacious vantage point, one can see the entire bar operation, interact with the staff, and have a good spot for some solo-work. Great touch, not enough bars at “coffee bars” these days. LAMill has been around for a while and as such, there has been substantial investment in the equipment. I took note of the inventory; 3 clovers (two on the bar, one on a back bar, in red and black), a gold La Marzocco FB, an entire shelf of Chemexes and neoprene Cafe Solos, and multiple Mahlkonig grinders of varying utility. The promise of such high-end equipment means that if the baristas are well versed, there are endless options and variety for the LA Mill’s customers. Some people have lamented that the upscale aspects of LAMill were a bit off-putting, but to each their own; some people don’t like their coffee coming from “kids in an ice cream shop.” I think what I enjoyed most about the visit was how it reinforced some of my beliefs about “good coffee”; not all successful coffee shops need to be trendy. In LA, that might almost seem impossible. In fact, I might go as far to say that LAMill is quite low key. The staff was refined, polite, though a bit quiet (like a well refined machine that was slightly lacking in what some would consider “standard” coffee shop hospitality). But no matter, the staff is more than accommodating. 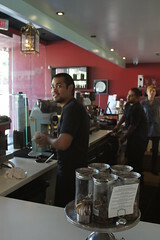 My barista wasn’t some “cool kid” with a hyped style or a jazzy attitude, he was just a nice fellow with some skills. You don’t need the hippest barista sporting the latest trends to make good coffee. I just hope others realize this next time they visit Silver Lake. I do want to take a moment to express one small displeasure with LAMill. After visiting their website, the author be-musingly wrote an anecdotal personal story to describe the mission of LAMill Coffee. Essentially, the author suggests that their beans are, “best coffee in the world.” LAMill makes a solid cup well beyond par, and this story was just an allusion to high quality. But making such a claim, even facetiously, is quite a statement in the industry, especially if this is your message to customers. While my experience was totally positive, I would not tell anyone they are “the best”; they are one of a few good roasters in the LA area.